In fact, in terrestrial habitats especially, it is not sensible to consider radiation as a resource independently of water. Intercepted radiation does not result in photosynthesis unless there is CO2 available, and the prime route of entry of CO2 is through open stomata. But if the stomata are open to the air, water will evaporate through them. If water is lost faster than it can be gained, the leaf (and the plant) will sooner or later wilt and eventually die. But in most terrestrial communities, water is, at least sometimes, in short supply. Should a plant conserve water at the expense of present photosynthesis, or maximize photosynthesis at the risk of running out of water? Once again, we meet the problem of whether the optimal solution involves a strict strategy or the ability to make tactical responses. There are good examples of both solutions and also compromises. Perhaps the most obvious strategy that plants may adopt is to have a short life and high photosynthetic activity during periods when water is abundant, but remain dormant as seeds during the rest of the year, neither photosynthesizing nor transpiring (e.g. many desert annuals, annual weeds and most annual crop plants). Second, plants with long lives may produce leaves during periods when water is abundant and shed them during droughts (e.g. many species of Acacia). Some shrubs of the Israeli desert (e.g. Teucrium polium) bear finely divided, thin-cuticled leaves during the season when soil water is freely available. These are then replaced by undivided, small, thick-cuticled leaves in more drought-prone seasons, which in turn fall and may leave only green spines or thorns (Orshan, 1963): a sequential polymorphism through the season, with each leaf morph being replaced in turn by a less photosynthetically active but more watertight structure. Next, leaves may be produced that are long lived, transpire only slowly and tolerate a water deficit, but which are unable to photosynthesize rapidly even when water is abundant (e.g. evergreen desert shrubs). Structural features such as hairs, sunken stomata and the restriction of stomata to specialized areas on the lower surface of a leaf slow down water loss. 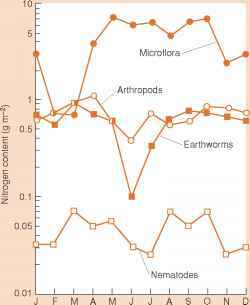 But these same morphological features reduce the rate of entry of CO2. Waxy and hairy leaf surfaces may, however, reflect a greater proportion of radiation that is not in the PAR range and so keep the leaf temperature down and reduce water loss. Finally, some groups of plants have evolved particular physiologies: C4 and crassulacean acid metabolism (CAM). We consider these in more detail in Sections 3.3.1-3.3.3. Here, we simply note that plants with 'normal' (i.e. C3) photosynthesis are wasteful of water compared with plants that possess the modified C4 and CAM physiologies. The water-use efficiency of C4 plants (the amount of carbon fixed per unit of water transpired) may be double that of C3 plants. The viability of alternative strategies to solve a common problem is nicely illustrated by the trees of seasonally dry tropical forests and woodlands (Eamus, 1999). These communities are found naturally in Africa, the Americas, Australia and India, and as a result of human interference elsewhere in Asia. But whereas, for example, the savannas of Africa and India are dominated by deciduous species, and the Llanos of South America are dominated by evergreens, the savannas of Australia are occupied by roughly equal numbers of species from four groups (Figure 3.10a): evergreens (a full canopy all year), deciduous species (losing all leaves for at least 1 and usually 2-4 months each year), semideciduous species (losing around 50% or more of their leaves each year) and brevideciduous species (losing only about 20% of their leaves). At the ends of this continuum, the deciduous species avoid drought in the dry season (April-November in Australia) as a result of their vastly reduced rates of transpiration (Figure 3.10b), but the evergreens maintain a positive carbon balance throughout the year (Figure 3.10c), whereas the deciduous species make no net photosynthate at all for around 3 months. be diurnal or may be quickly responsive to the plant's internal water status. Stomatal movement may even be triggered directly by conditions at the leaf surface itself - the plant then responds to desiccating conditions at the very site, and at the same time, as the conditions are first sensed.